Lock in a great price for Crowne Plaza Gerrards Cross - rated 9 by recent guests. Friendly staff. Comfortable rooms, good breakfast. We stayed one night as a stop-off and would recommend. Very nice and clean, I asked for a request that got done free of charge so that was lovely. Reception staff were great. Comfortable bed + good showers. The staff were very good and there were complimentary refreshments in the room. Very nice comfortable room (Club King). Bed was lovely. Breakfast was tasty and reasonable range (though we didn't have anyone to help us figure out how to make/get toast lol). Food was still delicious though. Offering free WiFi and free parking, the stylish 4-star hotel Crowne Plaza Gerrards Cross is ideally situated in Beaconsfield, in the heart of Buckinghamshire, just a few minutes' drive from both the M40 and M25 motorways. Guests can enjoy cocktails and drinks in the bar, and there is a fitness centre and onsite spa. Crowne Plaza Gerrards Cross offers well-appointed rooms with comfortable beds and luxurious bed linen. 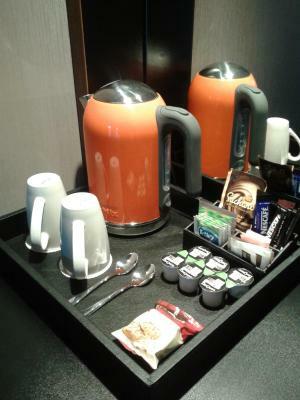 Rooms come complete with a TV, minibar and tea/coffee making facilities. Every room has an en-suite bathroom with either a bath or shower. The on site restaurant and lounge offer a comprehensive selection of dishes influenced from the local area, freshly prepared. There is a wide variety of breakfast options available including cooked options, Continental and fresh fruit. The fitness and wellness centre features a 20 yards indoor pool, with spa pool, sauna, steam room and feature shower. Spa treatments are also available including facials, massage and beauty treatments. The gym has a range of cardio equipment and a spin studio, and fitness classes are also available. Crowne Plaza Gerrards Cross has 7 meeting rooms with the largest room accommodating up to 300 people. Heathrow Airport is 25 minutes from the property by car, and from Gerrards Cross or Beaconsfield train stations Central London can be reached in 25 minutes. Warner Brothers Studio is 13 miles away. Crowne Plaza Gerrards Cross has been welcoming Booking.com guests since 1 Aug 2005. When would you like to stay at Crowne Plaza Gerrards Cross? 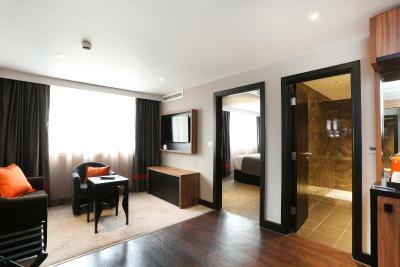 This double room features a iPod dock, complimentary mini bar and tea/coffee and flat-screen TV. This double room has a complimentary mini bar and flat-screen TV. This room has a super-king bed, a complimentary mini bar and luxury bathrobes, slippers and toiletries. This room has a king-size bed, complimentary mini bar and tea and coffee. This double room has an emergency cord in the bathroom and bedroom. There is a roll-in shower with handrails and a raised toilet. The bedroom furniture can be rearranged if required. There are both audible and visual fire alarms in the rooms and hallways, and vibrating pillows are available. This twin room room has 2 double beds, complimentary mini bar and tea/coffee. This suite features a living room area, a super king-size bed, a complimentary mini bar. Luxury toiletries, bathrobes and slippers are also provided. House rules Crowne Plaza Gerrards Cross takes special requests - add in the next step! Crowne Plaza Gerrards Cross accepts these cards and reserves the right to temporarily hold an amount prior to arrival. It was clean and felt new and well furnished. Cleaned room early when we were arriving back from breakfast so had to leave and wait elsewhere. More of our experience was a disappointment then what we expected, we wanted to come away for 1 night for a spa evening, we picked a hotel with a swimming pool, jacuzzi and steam/sauna! Unfortunately, the jacuzzi was not working! If we knew this we wouldn’t have booked because this is something we enjoy using! When we spoke to staff they said it was broken for 4 weeks already and had another 5 weeks to go! We were very unhappy we were not told of this before our booking! Lastly, when we were asleep at 6am there was screaming kids running around the hallways! We were right at the end of the hallway however the noise did in fact wake us up! Not very happy, when paying almost £100 for the night, we would have expected a little better! Wanted a shower in the evening water was very cold but apart from that lovely stay. Jacuzzi wasn't working, view wasn't great + my phone charger I left in the room never got handed in! Perhaps a little overpriced. The jacuzzi wasn't working in the health club. Unfortunately the Jacuzzi wasn't working during our stay, the hotel let us know beforehand but it was still pretty disappointing as booked the hotel for the spa facilities.